Pips in the bag for AUD/JPY! Aussie bulls continued to charge after I hopped in a long position at market, so I’m locking in some gains from here. This pair broke past the double bottom neckline a few weeks back then completed a quick retest before heading further north. I was a bit late to the game since I was able to go long on a break of 85.00 and the previous week high, but I’m still feeling pumped about these bullish moves! The climb has been pretty steep as it was spurred mostly by a bout of yen weakness on the global bond selloff. To top it off, the Bank of Japan seems to be trailing way behind its central bank peers when it comes to the idea of reducing stimulus. The Land Down Under didn’t exactly have a lot of major reports this week, but risk appetite has been on its side and its medium-tier releases have shown some improvements. With that, the pair is within striking distance of my profit target close to the 87.00 handle. I’m not gonna let my guard down, though, as Japan has its household spending and inflation reports on tap. Retail sales turned out weaker than expected so overall spending could be bleak, but the national and core CPI readings could show small gains that might prop the yen up. I’m adjusting my stop higher to lock in some profits at 85.75 in case the pair sells off sharply during these releases. Also, I’m on the lookout for potential reversals since it’s almost the end of the week, month, and quarter. This adjustment should seal in 60 pips or a 0.21% gain on my account if the stop gets hit. Think I made the right adjustments or should I just close at market to take my profits at current levels? 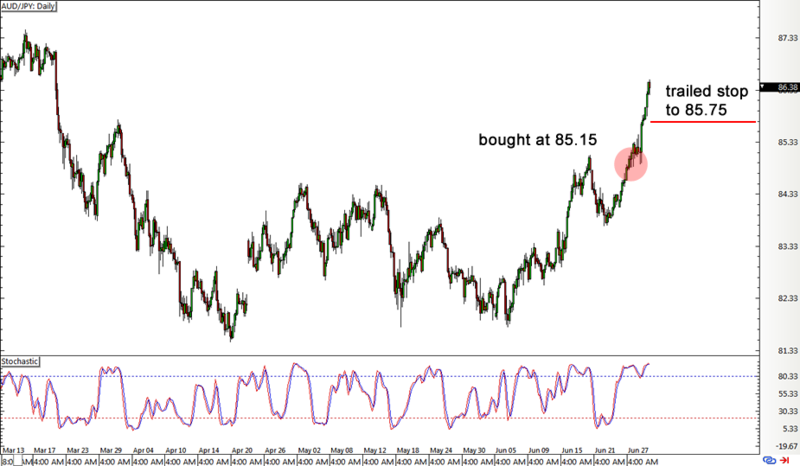 I’ve got my one good eye on this AUD/JPY double bottom for quite some time, and I’m gonna hop in at market now that price surged past the neckline. Ugh, talk about being too cautious! My adjusted stop loss got hit on a quick dip just before price made it all the way up to my target anyway.